Two teenagers, a brother and a sister from a strict religious family disappear. The parents are alarmed but Scotland Yard says they are just off sowing their wild oats. A horrific, gruesome package arrives in the post and it becomes clear that a terrible crime is in process. Sherlock Holmes is called in to help. Passions and hatred going back many years are revealed. Holmes, Watson, and Lestrade must act quickly before young lives are lost. 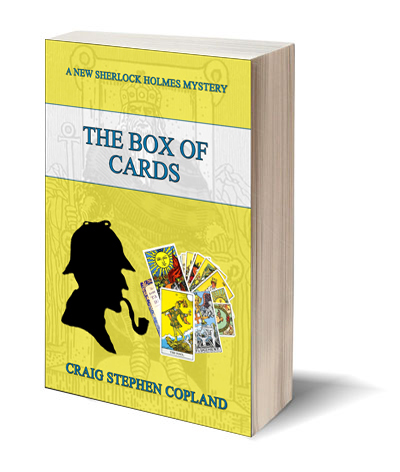 This mystery, set in London in 1905, is inspired by the original Sherlock Holmes story, “The Cardboard Box,” one of the darkest and most gruesome of the original Canon. If you enjoy the mysteries of Sherlock Holmes, you will again be treated to watching your hero untangle the web of evil and bring justice to all involved. Buy it now and enjoy yet another new Sherlock Holmes Mystery.